1. OGCT. This is known as the ?Official Government Conspiracy Theory?. This version states that a guy from a cave in Afghanistan conspired with 19 boxcutter-wielding Muslims to hijack airplanes, outwit the USA?s entire multi-trillion dollar defense system, and cause the Twin Towers to collapse. This is the version pushed by the government and media as being the truth of 9/11. 2. APCT. I call this the ?Alternate Propaganda Conspiracy Theory?. This version states that, more or less, there were hijackings on 9/11, but the planes might have been taken under remote control to ensure they crashed as planned. Airplanes most likely crashed at the Pentagon and Shanksville, but planes definitely did crash into the Twin Towers. The Twin Towers and WTC 7 collapsed from conventional explosives and thermite, and molten metal was found in the rubble. This is the version pushed by the government and media as being the ?wacko conspiracy theory? that the ?truth movement? believes. 3. REAL. 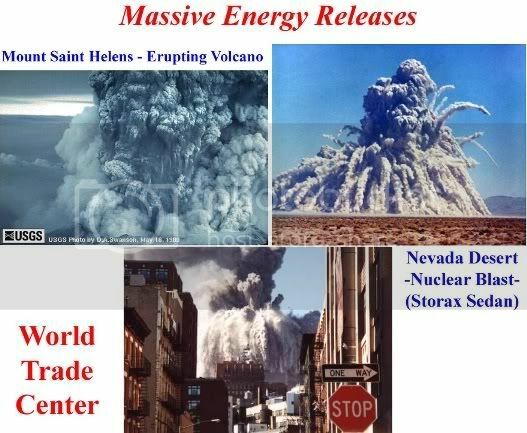 This, simply, is the REAL version, backed by actual evidence, Laws of Physics, and common sense: There were no hijackings, no plane crashes, the corporate media broadcasted cartoons of an airplane impacting the South Tower, and the WTC complex (not just the Towers and WTC 7) was destroyed with Directed Energy Weapons (DEW). The government and media steer clear of these. Refer to the Lenin-credited quote above. Is it possible the ?truth movement? has been run by the 9/11 perpetrators since day one? Is it possible that certain individuals have been planted to steer the ?truth movement? away from the perpetrators? Is it possible these plants have affiliations with directed energy weapons (DEW)? Is it even possible that some of these plants are ?in on it? while others got suckered in? You be the judge. ***Former Transportation Secretary, Norman Mineta, has ties to the Directed Energy Professional Society (DEPS). Mineta was Vice President of Lockheed Martin, a sponsor of DEPS. Mineta ensured minimal interference with the DEW by grounding as many commercial airliners as possible during the timeframe of the towers? destruction. Mineta steered the ?truth movement? toward hijackings and plane crashes by spreading the ?Cheney stand down order? hoax. ***Former BYU physics professor, Steven Jones, has done research at Los Alamos where directed energy weapons are researched. Jones steered the ?truth movement? toward thermite/conventional explosives/molten metal theories. Jones? molten metal evidence has been shown to be fabricated. Jones ridicules the directed energy weapon and TV-Fakery theories with statements such as ?These two are noted for their no-planes-hit-the-Towers theories and for promoting the notion of ray-beams from space knocking down the Towers.? "This work was supported in part by NSF grant DMR-9705129 and by funding from the NSA." Jenkins? papers were listed in an annual report which also listed at least one manufacturer of directed energy weapons (Rockwell). ***Official at the New Mexico Institute of Mining and Technology, Van Romero, has ties to the Directed Energy Professional Society (DEPS). Romero participated in events at DEPS before and after 9/11. Romero steered the ?truth movement? toward standard controlled demolition by stating "It could have been a relatively small amount of explosives placed in strategic points"
Romero is a controlled demolitions expert. Scroll down a little and note the photo. Does Romero actually think this was caused by a ?relatively small amount of explosives?? ***Former Director of the Star Wars program, Robert Bowman, is about as close to directed energy weapons as one can get. Bowman steered the ?truth movement? toward hijackings, and NORAD standing down. Although he is in Jim Fetzer?s Scholars group, I have not heard him speaking about Dr Wood?s DEW evidence. I do remember, however, an interview where Bowman states that he ?doesn?t fall for conspiracy theories? with regard to controlled demolition. Bowman has a PhD in Nuclear Engineering. How can he possibly call this a conspiracy theory? Dr Judy Wood has discovered that ARA and SAIC are manufacturers of Directed Energy Weapons and have expertise in Psychological Operations (PSYOPS). Dr Wood also discovered two images on ARA?s website that are similar to the World Trade Center. She details this in her Appeal to NIST?s denial of her Request for Correction. The New York Times is a mainstream media source. Do they tell the truth of 9/11 or do they hide it? Why on earth would they help the ?truth movement? by publishing evidence of explosives? The New York Times steered the ?truth movement? towards explosives demolitions by publishing the WTC Task Force Interviews. However, they redacted evidence for Directed Energy Weapons. Who's Popular On Corporate Media? Who's Not? The following is a timeline relating to promotion of the Alternate Propaganda Conspiracy Theory by government plants and the media, and suppression of the REAL version by government plants and media. Also included is suppression of free energy research. Page generated in 0.03693509 seconds (83.73% PHP - 16.27% MySQL) with 34 queries.